Vernon Howard wrote and taught for many years on one vital topic: There is a way out of human suffering and any earnest person can find it. The life-healing principles taught in his books and tapes contain a variety of guides and inspirations by which you can change your life. They answer questions and banish problems which may have been burdens for years. They will supply the answers you’ve been looking for all your life. From now on you can make life work for you not against you. These exciting methods can help you start life all over. Your own mind is the key which unlocks the secrets of life. Delightful feelings will arise as these powerful truths are absorbed. Let them succeed by turning every day into a new and refreshing day. True relief and happiness await you. Click on the link in the next line and it will take you to an excerpt from The Esoteric Path to a New Life which gives a clear and concise explanation of the human condition here on this earth. These practical spiritual ideas are new solutions for your home life, love life, everywhere. They will save you years of search and struggle. Investigate it and find out for yourself. 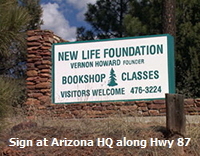 New Life is a nonprofit, federally tax-exempt educational, eleemosynary organization founded by Vernon Howard in the 1970s for the distribution and dissemination of a true teaching. It is dedicated to sharing true principles of self-understanding and success as a human being. It is for anyone who has run out of their own answers and has said to themselves, “There has to be something else.” These teachings are the something else. All are encouraged to explore and apply these profound truths. Find out for yourself. — Dr. Jason Miller, MD, Ph.D.
Vernon Howard was born in Haverhill, Massachusetts on March 16, 1918. When he was a boy his family moved to California where he lived for many years. He began writing and lecturing there on spiritual topics. He eventually moved from Los Angeles to Boulder City, Nevada where he lived and taught for many years. In 1979 he founded New Life Church and Literary Foundation.